What Are the Causes of Pain When Breathing? Pain provoked by breathing occurs with a variety of conditions that range in severity from transient, mild medical problems to potentially life-threatening illnesses. Chest discomfort triggered or aggravated by forceful breathing, coughing or straining is known as pleuritic chest pain. Common causes include chest injury, infection, a lung blood clot and inflammation of the sac surrounding the heart. Cancer affecting the lungs, autoimmune diseases and certain abdominal conditions are less frequent culprits. Although pleuritic chest pain may not indicate a serious problem, prompt medical evaluation is necessary to determine the underlying cause and appropriate treatment. Pain associated with breathing may arise with an injury to the chest wall. Movement of the chest that occurs with breathing typically provokes or worsens pain caused by a broken rib, a pulled chest muscle or a chest wall bruise. In most cases, this causes one-sided chest pain. Less commonly, a lung may be punctured from a penetrating chest injury, like a stab wound, or fragments of a broken rib. This can lead to air leakage from the lung into the chest cavity, a condition called pneumothorax. 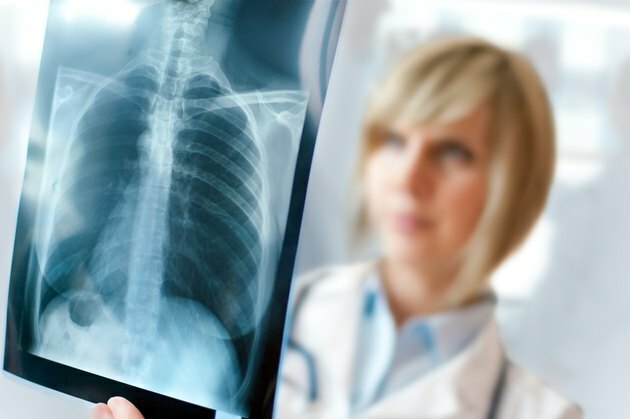 Pain with breathing is a common symptom of pneumothorax, along with shortness of breath. Pneumothorax can also occur without a precipitating injury, leading to the same symptoms. This most frequently occurs in people with preexisting lung disease, such as asthma, cystic fibrosis and chronic obstructive pulmonary disease (COPD). Pleuritic chest pain often accompanies pneumonia, an infection of the lungs. Common causes of bacterial pneumonia include pneumococcus, Mycoplasma pneumoniae and Chlamydia pneumoniae. Viruses can also cause pneumonia, including the influenza and respiratory syncytial virus. When the infection responsible for pneumonia approaches the lung surface, it typically inflames the pleura -- the tissue that encases the lungs and lines the chest wall. This inflammation triggers pain with breathing. Other frequent pneumonia symptoms include fever, chills, cough and shortness of breath. A lung abscess -- a pocket of infection and pus -- near the lung surface can also cause pleuritic chest pain, usually on one side of the chest. This might occur due to accidental inhalation of saliva or stomach contents, or bacterial seeding of the lung in people with an infected heart valve. Tuberculosis also commonly causes lung abscesses. A thin layer of tissue called the pericardium surrounds the heart. The pericardium abuts the pleura. Conditions that cause inflammation of the pericardium -- called pericarditis -- can lead to pain with breathing. Pleuritic chest pain due to pericarditis most frequently occurs in the middle of the chest, beneath the breastbone, or slightly to the left of this area. Several conditions can cause pericarditis, but a viral infection is most commonly to blame. Bacterial infections, rare drug reactions and radiation therapy to the chest represent some of the less common causes of pericarditis. Additionally, although pericarditis is not a typical short-term symptom of a heart attack, it may develop in the following days to weeks as damaged heart tissue triggers an inflammatory response that may affect the pericardium. Cancer originating in the lungs or that has spread to the lungs from another organ -- such as the breast, colon or prostate -- might cause pleuritic chest pain if the cancer is located at the surface of the lung and involves the pleura. Cancer arising from the lung most frequently develops in older adults who smoke or used to smoke. Other symptoms of cancer in the lungs may include shortness of breath, weight loss, and a new or different cough. Autoimmune conditions are uncommon causes of pain with breathing. This occurs only if the lungs are affected by the disease. Examples include rheumatoid arthritis, systemic lupus erythematosus and Sjogren syndrome. Typical symptoms of these conditions usually occur along with pleuritic chest pain, which helps point to the underlying cause. With autoimmune conditions, pleuritic chest pain typically develops over days to weeks rather than suddenly. When other more common causes of pleuritic chest pain have been ruled out, doctors must consider the possibility of an abdominal condition. Those that might inflame the diaphragm -- the muscle that separates the chest and abdominal cavities, and moves up and down with breathing -- are most likely to trigger breathing-related pain. Possible considerations include Crohn disease, infection of the liver or abdominal cavity, and inflammation of the pancreas. Current Diagnosis and Treatment in Emergency Medicine, 7th Edition; C. Keith Stone, M.D., and Roger L. Humphries, M.D. Bonica's Management of Pain, 4th Edition; Scott M. Fishman, et al. Diseases and Disorders; Victoria J. Fraser, M.D., et al. What Are the Causes of Pain in the Chest Wall?